Plagued by a mysterious presence from their past, Jack (George MacKay) looks to protect his family after the passing of his mother. With an impressive young cast and mysterious, well-made trailers, 'The Secret of Marrowbone' looked incredibly promising. Eery whilst not giving much away about the story, the film was set up to look like a tense and interesting affair by its marketing. Unfortunately, this was not transferred into the final product at all, with the film being extremely disappointed and very messy. It must be said that despite this film failing to hit the mark, it isn't at all to do with a lack of effort or laziness. 'Marrowbone' is the directorial debut from successful screenwriter Sergio G. Sanchez and is a fairly ambitious effort from the Spanish filmmaker. However, Sanchez' inexperience as a director shows as he looks to cram in more than the film can handle as the film has major pacing issues. The first half often forgets at times that it's a horror film but does very little to build character or use the time to create interesting scenarios to keep you engaged. There's a weirdly large chunk of time dedicated to playing on the beach and decorating as if the film was a BBC special about children in the countryside which doesn't mix well with the tone the film tries to set later on. During this time there is no attempt at all to try and build any sort of interesting or likable characters. To sum up, the first half of the film is very poor, with it being dull, lifeless and sadly, downright boring. The second half tries to make up for this a bit too much as the pacing goes from 0 to 100 very quickly. Soon enough lots of information and events are rapidly being thrown in with little breathing period. In amongst the ending is a twist that the film heavily relies on but its effect gets lost in amongst all of the ongoing chaos. The film is very unbalanced with far too little of interest happening early on and then far too much ensuing nearer the end and by that time, you've already checked out. 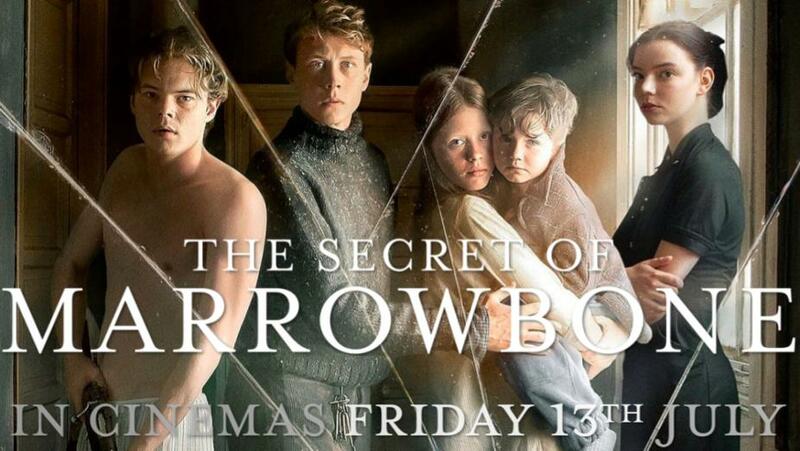 As previously mentioned, the cast for this film made 'Marrowbone' a lot more appealing with an impressive crop of young talent but even this aspect failed to deliver. Anya Taylor-Joy is completely wasted as a love interest with very little character other than her endearment for Jack, played by George MacKay. MacKay is undoubtedly a talented actor, but the script sees quite an emotionless performance with the occasional overly shouty dialogue that doesn't allow him to showcase his abilities. As for the likes of Charlie Heaton and Mia Goth, they are only there to make up the numbers as again they are wasted. There isn't much character in this film at all and with the dull story, it doesn't make for an entertaining viewing. What is unquestionably disappointing is the horror elements, as the film resorts to predictable jump scares and loud noises as its main source of 'horror'. There was a potentially interesting element regarding mirrors but it falls completely flat combined with the final twist. This is perhaps the most disappointing part of this film as the scares don't seem to have much thought within them. Although the rest of the film does miss the mark, there is a clear intention to try something ambitious and slightly out of the box. Unfortunately, with its execution of horror, the same cannot be said. 'The Secret of Marrowbone' does take risks with its storytelling but the craftsmanship isn't quite there. The pacing is all off which really harms the effectiveness of the chaos that ensues later on in the film with there being very little of interest happening early on. Despite an attempt to create a film that really makes you think, 'Marrowbone' is certainly an unfortunate misfire.